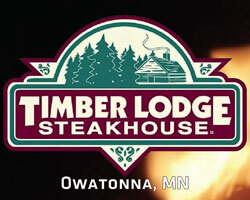 Timber Lodge Steakhouse sells gift cards in any denomination. Please fill out the form below and one of our staff will call you with in one business day to process your gift card order. For more prompt service, please stop in at 4455 West Frontage Road, Owatonna, MN 55060 or call us at 507-444-0303. Please fill out the form below and one of our employees will call you shortly to process this gift card order. Timber Lodge Steakhouse also offers scrip program for many local schools and organizations. How our scrip program works. To help raise money for your organization, we will sell you gift cards at a discounted rate of 10%. You then sell these to your organizations members at face value and you keep the profits. Please contact us for more information.